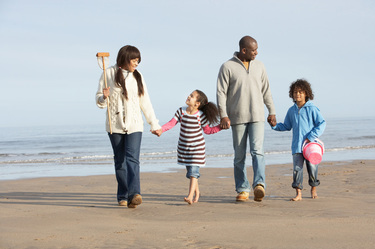 Term life insurance is the simplest and least expensive type, as it pays benefits only upon the policy holder's death. With annual renewable term insurance, the policy holder pays a low premium at first, which increases annually as he or she gets older. With level term insurance, the premium amount is set for a certain number of years, then increases at the end of each time period. Experts recommend that people who select term insurance make sure that their policies are convertible, so they can switch to a cash-value plan later if needed. They also should purchase a guaranteed renewable policy, so that their coverage cannot be terminated if they have health problems. Term insurance typically works best for younger people with children and limited funds who are not covered through an employer. This type of policy enables such a person's heirs to cover mortgage and college costs, estate taxes, and funeral expenses upon his or her death. With whole life insurance, the policy holder pays a level premium on an annual basis. The policy usually covers until the end of the person's life—age 90 or 100. In most cases, the policy holder is overcharged for the premium, and the extra amount goes into an interest-bearing dividend account known as a cash value account. The individual can use the money in this account to pay future premiums, or can withdraw it or borrow against it to cover living expenses. With a variable whole life policy, the individual controls the investments made with his or her cash value account. Selecting certain types of investments, such as mutual funds, may allow the policy holder to increase the balance in the account significantly. Regardless of the performance of the investments, however, the amount of the insurance benefit can never drop below its original value. When choosing a whole life policy, experts note, it is important to analyze the fund's past performance and inquire about commissions and hidden costs. Although whole life insurance can provide added security upon retirement, it should not be considered a replacement for retirement savings. In fact, Janecek revealed that, on the average, whole life policy holders only yielded between 2 and 4.5 percent on their investments over a twenty-year period. Universal life insurance was introduced in the 1980s as a higher-interest alternative to whole life insurance. Universal life premiums are based not only on the cost of the insurance, but also on the interest rate offered on investments. Still, they are usually less expensive than whole life policies. Universal life policies provide individuals with a wider array of investment choices and higher projected interest rates. They are essentially similar to a term policy with a fixed rate of interest guaranteed for a year at a time. Current assumption life insurance features a fixed annual premium for the duration of the plan. This type of policy pays a set interest rate on premiums received, less the actual cost of the insurance. They can be useful as a tax-deferred investment vehicle, since they usually pay 2 to 4 percent more than banks. Policy holders may elect to overpay their premiums early in the plan period to accumulate cash value. They can withdraw or borrow from the funds later for any purpose, including retirement income, or can use the cash value to pay the premiums for the remainder of the plan period. Most types of life insurance policies give individuals the opportunity to add optional coverage, or riders. One popular option is accelerated benefits (also called living benefits), which pays up to 25 percent of the policy value to the holder prior to their death if they are struck by a serious illness. Another option, known as a waiver of premium, allows an individual to continue coverage without paying premiums if he or she becomes disabled. Many policies also provide an accidental death and dismemberment option, which pays twice the amount of the policy if the insured dies or loses the use of limbs as a result of an accident. Small businesses tend to depend on a few key people, some of whom are likely to be owners or partners, to keep operations running smoothly. Even though it is unpleasant to think about the possibility of a key employee becoming disabled or dying, it is important to prepare so that the business may survive and the tax implications may be minimized. In the case of a partnership, the business is formally dissolved when one partner dies. In the case of a corporation, the death of a major stockholder can throw the business into disarray. In the absence of a specific agreement, the person's estate or heirs may choose to vote the shares or sell them. This uncertainty could undermine the company's management, impair its credit, cause the flight of customers, and damage employee morale.Life insurance can help small businesses protect themselves against the loss of a key person by providing a source of income to keep business running in his or her absence. Partnership insurance basically involves each partner acting as beneficiary of a life insurance policy taken on the other partner. In this way, the surviving partner is protected against a financial loss when the business ends. Similarly, corporate plans can ensure the continuity of the business under the same management, and possibly fund a repurchase of stock, if a major stockholder dies. Although life insurance is not tax deductible when the business is named as beneficiary, the business may deduct premium costs if a partner or owner is the beneficiary.